In our journey of headless photography, we have explored capturing the details of the wedding flowers, the bride’s dress, and the groom’s attire. This post will highlight the last, but certainly not least, detail captured by headless photography: their love. When you think about photographing the love between a bride and groom, your immediate thought may be to capture the kisses they share. Of course a photograph of a kiss would take us above the shoulders and, thus, negate the use of headless wedding portraits. Besides, love can be captured in a photograph through more than a kiss. You know the old saying: “a picture speaks a thousand words.” Well, the same could be said of a loving touch; body language also allows us to communicate without words. Body language is used to express feelings and tells us something more about the relationship between people. In the picture below, we see the bride nestled in close with the groom. With is arm wrapped around her and his hand holding hers, we have a casual, yet intimate, look at their love. This photo captures the easiness they have in their love for one another. 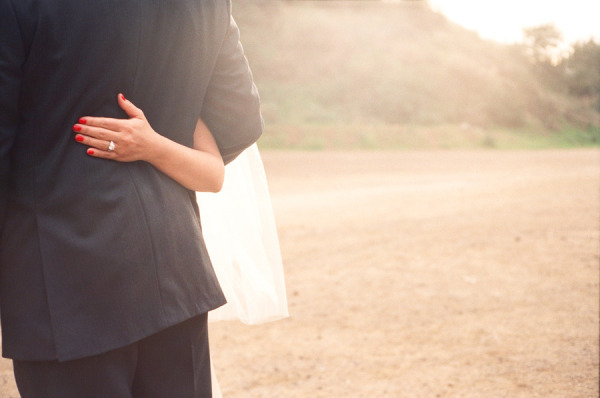 In the next photo, the bride has her arm wrapped around the groom with her hand near the small of his back. Although you cannot see her entire body, the photo showcases of her hand embellished with her wedding ring–the ultimate symbol of their love. This photo gives a simple and beautiful look at the love they share. The next photo captures the brides arms slung around the groom’s neck as they embrace–the perfect pose for a kiss. Although the photograph does not capture the kiss, you can imagine that a kiss is taking place in a pose like this. Like the photograph above, the bride’s wedding ring is on display in this photo. Headless wedding portraits don’t need to be extravagant to capture the love between the bride and groom. Take the next photograph as an example. The bride and groom are casually sitting on an old trolley. Their love is captured by holding hands and the bride leaning in close to her groom. If there is a major height difference between the bride and groom, it may be difficult to fully capture headless wedding portrait without it looking awkward. In the case of the photograph below, having part of the head in the photo may turn out beautifully. 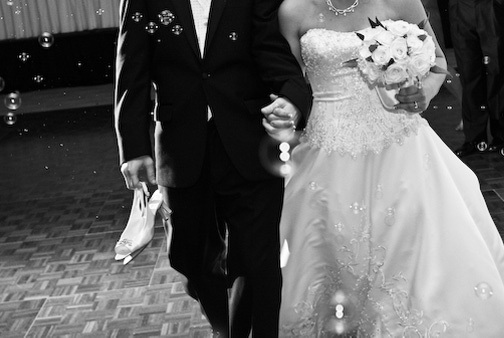 In the photo below, the bride is significantly shorter than the groom and part of her head is showing. By tucking her hand in his arm, pulling in close, and resting her head on her husband’s shoulder you can sense the closeness and love. The combination of all three makes for a very romantic photo. Photo courtesy of Anna KuperbergEven while sitting down when height is not an issue, capturing part of their heads may turn out to be a beautiful shot that captures the love between bride and groom. Though you cannot see their faces, you can imagine the bride and groom gazing into one another’s eyes in the photo below while it highlights the closeness of their bodies. 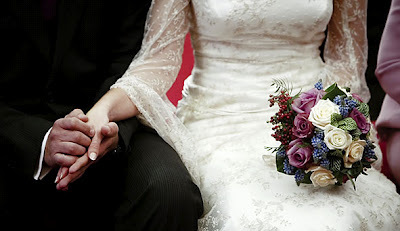 The love between a bride and groom can be captured in the way they hold hands. And even in the way he carries her shoes! 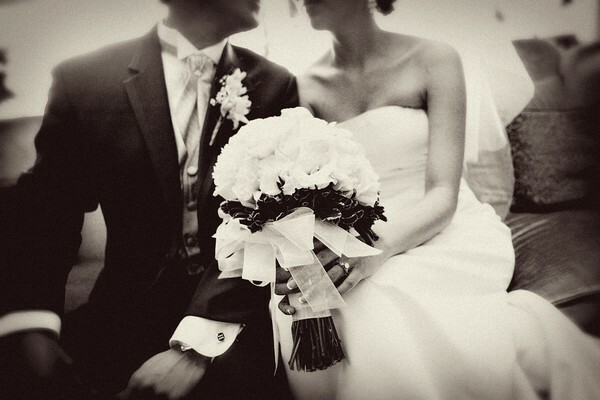 A photo focused on the hands of a bride and groom sitting side-by-side can capture 1,000 sentiments of love. 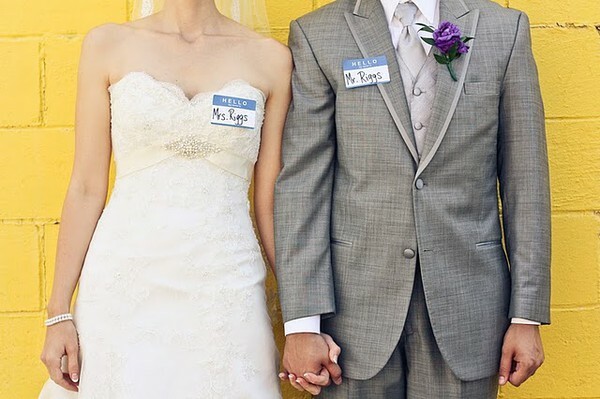 Headless wedding photographs allow us to draw more attention to the details of the wedding. They help us to beautifully capture one of the most important details of them all: their love.